The eagles are perched on top of the columns of the Terminal Station building. They have all been recently returned to the station. Macon's 1916 Terminal Station, at the foot of Cherry Street downtown, is Georgia's grandest surviving railroad station. 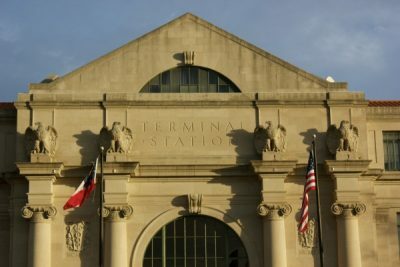 It was designed in the Beaux Arts style by architect Alfred Fellheimer (1875-1959), who with his partners also designed stations in Cincinnati, Buffalo, and other cities. The 13-acre station was owned by the Macon Terminal Company, which in turn was owned equally by the Central of Georgia, the Southern Railway, and theGeorgia Southern & Florida. Each of these companies, along with the Georgia Railroad, had offices on the upper floors. Other railroads using the station were the Macon, Dublin & Savannah and the Macon & Birmingham. In 1926-27, the station handled as many as a hundred arrivals/departures each day. The eight tracks for through trains and ten tracks for local trains had platforms between each track. The through tracks were connected by a tunnel. After closing in 1975, the building stood unused several years until it was purchased by Georgia Power Company in 1982 and used as its local offices in the 1980s and 1990s. In 2002, the City of Macon received one million dollars in TEA funds to purchase the building from Georgia Power and convert it to a retail, office, and multi-modal transportation center. A $6 million rehabilitation completed in 2010 brought back much of the building's historic and architectural character.